Review of Upright Brewing Six | Beer Apprentice - Craft Beer News, Reviews, Interviews and Info. Hi guys. For today’s craft beer review I’m going to continue with my journey through the “numbered” beers produced by the Upright Brewing Company situated in Portland, Oregon. This time I’m going to be sampling the Six. Let’s just go ahead and get to the website, uprightbrewing.com, so we can find out what the Six is all about. Six is a rye beer displaying the great spicy notes the grain is known for along with a deep caramel core and delicate bubblegum note rooted in its open fermentation. Despite being dark in color, the beer finishes quite dry and refreshing. This beer had an ABV of 6.7% and it came in a 25.4 oz. vessel. It discharged a hazy, deep burgundy color with some ruby highlights showing when held toward the light. The cap was an egg-shell/light tan color that was frothy, soapy, and rocky. The girth was excellent and the retention time was more than adequate. The lacing was patchy, however prominent. A nice looking beer in my opinion. The nose released hints of dark fruit. Mostly black cherries and plums. Light touches of peppery spice and a deep, yeasty rye bread fragrance were noted and enjoyed immensely. The funkiness was very, very, very light. After it warmed I also began to notice a slight waft of red apple skins or something. Very nice. I also found some of that apple in the taste too along with tones on non-sweet cherries. A fine shot of rye bread and yeast combined with a solid dose of pepper really added some spice and bite. Toward the end I started to detect some savors of caramel malt with a very light earthy hop bite. The mouthfeel was medium bodied. Dry, somewhat crisp, however smooth at the same time. The carbonation was of medium strength and I also received a touch of warmth from the spices and alcohol. A solid shot of flavor was left behind on the palate after each sip. Overall, I found this to be a very good beer. I really liked the rye bread mixed with the darker fruits. The drinkability was rather good as well. In fact I believe that it could be enjoyed year round. It was crisp enough for Summer, however the spices and slight alcohol bite would lend itself nicely to the cooler months of the year. Either way, if you happen to see the Upright Brewing Six, pick it up and give it a try. Be sure to let me know of your opinion also. I’d be interested in hearing what you thought of it. 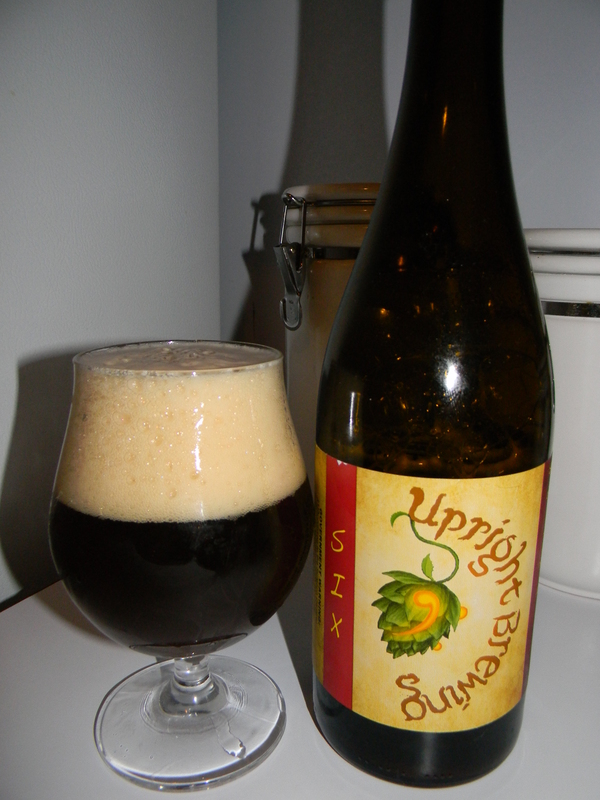 Posted by Beer Apprentice on May 5, 2013 in Country: USA, Upright Brewing Co.